Thirsty for adventure? 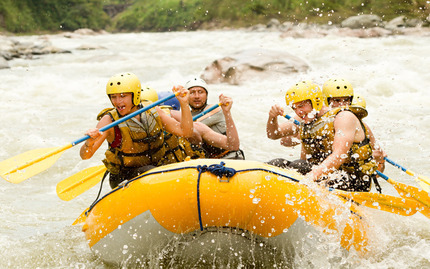 Drench yourself in thrills with this 10-mile whitewater trip down Kings River! 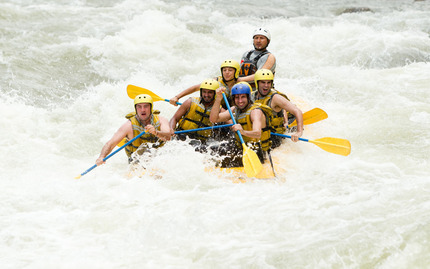 You'll plunge through exhilarating Class III rapids alongside an experienced river guide, crashing up and down swells and around boulders. You are surrounded by breathtaking scenery made up by the Sierra and Sequoia National Forests, so try to look up -- Although you might be too furiously engaged in paddling to notice! Prior to your adventure, you'll fuel up with a delicious chicken fajita lunch at the Twin Pines Camp, where you'll also get oriented on what's to come. After you've conquered the Kings River, more fun awaits with games of volleyball, horseshoes, and even a little fishing. You'll munch on happy hour snacks, and alcoholic beverages are available for the adults. Check out photos and videos from the day's adventure, followed by a BBQ dinner and ice cream sundaes. 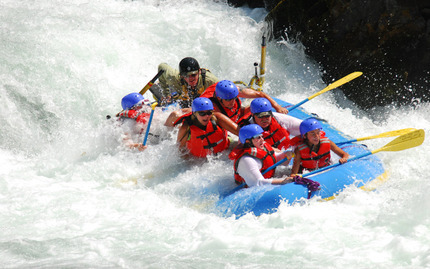 Less the $40/person non-refundable deposit, your payment is fully refundable if you cancel at least 31 days in advance. No refunds will be made on cancellations within 30 days of departure. Reservations can be transferred to an alternative date within the same season with no penalties 30 or more days prior to the original reservation date. Individual substitutions can be made with no penalty.